An intervention is when an individual or group of people help to get a person into a drug and alcohol rehabilitation program who is struggling with an addition. Usually an interventionist is a trained professional; however some choose to use Family Intervention as a tool. Family Intervention is when a group of family members, friends, co-workers or even church or group members come together to get an addicted person to get help. When an intervention is done with a trained professional, often called an Intervention Specialist the person will often coordinate or bring together, families, friends, groups or co-workers to help start and go through this process. The first step of this can begin with the initial contact with the Intervention Specialist and then a plan will be put together on how to direct the person to treatment. Oftentimes an intervention is a necessary step to getting an addict help. Usually is it because nothing else has worked even with a loving and caring family who wants the addict to get better. In most cases, the Intervention Specialist will work out who should attend the intervention before it happens. Those that can attend an intervention include family members, friends, or even co-workers depending on who the help is originating from. If not actually present at the intervention, these people can be involved in all phases of helping the person get to treatment. 1. Take action because you have a real concern or love for the individual and you want to help them. 2. Make sure your Intervention Specialist is trained and experienced. 3. Check the credentials of the Intervention Specialist. Ensure that they have a list of references and a percentage of successful interventions they can share with you. 4. Choose a place that is safe for the addicted individual. Doing an intervention in the home has statistically shown to be more successful than doing them at a public place. 5. Listen to the Intervention Specialist and let them guide you. 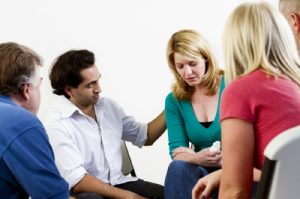 An intervention can be very emotional for both an addict and a family member or loved one. They can blow up easily, especially if the individual is coming down off drugs. 6. Allow the Interventionist to spend time alone with the addicted individual if needed. Sometimes discussing the addiction with the family is very difficult for someone currently on drugs. Allowing some space there will open the door for the Interventionist to be able to point the person in the right direction if needed. 7. Steer clear of mean or invalidative comments, hostility, condemning the person, or lecturing. Keep in mind that you are there to help the individual get into a drug and alcohol treatment program. Let them know that you care and want to help. 8. Have a treatment program picked out and inform the person of options regarding this. Sometimes this may require the Interventionist putting the individual on the phone with a counselor from the center. 9. If the individual does not want to go into a program or get help tell him or her about the consequences of this decision and their drug and alcohol addiction. Most families and loved ones will have to take action at this point. This may include kicking the addicted person out of the house, taking away money, cars etc to keep the person from using more drugs. 10. If the individual agrees to go into treatment help make the necessary arrangements such as paying for a program, or working out insurance or payment options, helping with pet care or child care, bills, whatever the person needs to be able to go and get help. Don’t give up hope. There are people every day who are struggling with addiction that go into treatment and fully recover. With continued support, tough love and insistence that the person handle their drug or alcohol problem you can help them take the necessary steps to get into treatment. Right now, with so many rehabilitation processes and intervention processes being televised, families and loved ones often think it is ok to do an intervention themselves without outside guidance from a professional. There is risk with this as sometimes families and loved ones only have one opportunity to help the addicted person and without guidance could say or do something to stop the process of getting the addicted person help. This is usually not done on purpose but without training and experience dealing with those addicted an intervention can go downhill very easily and blow up. The best thing to do is consult with a professional before performing an intervention on another person. We are more than happy to assist you or to help locate an interventionist that meets your needs. It is an old ‘adage’ that families and loved ones must let the addicted person ‘hit rock bottom’ before they can be helped. Rock bottom can mean many things to many different people. If left unhandled addiction can lead to prison, and even death. Help should be offered way before either of these two things are looming. In addition, to let an addiction continue will not only allow the addict to destroy himself but all of those around him including friends and family through lies, stealing and broken promises. Deep down the individual does not want to be an addict or alcoholic. The primary reason an intervention is done is to help the addicted person to get help and go into treatment. The way your intervention is done should depend on the individual and what will work best for him or her. When an intervention is done out of love and by those who truly care about the individual and want to see them get better it cannot be a bad thing. The response of the addicted person is sometimes difficult to tolerate but you must remember that people do things on drugs and alcohol that are out of character. In most cases the individual will end up deciding to get the help that he or she needs and take the steps necessary to get on the path towards recovery. The Intervention Specialist can then work with the family to safely transport the addicted person into a rehab center to start the recovery process. Contact us today for more information on setting up an intervention at 800-469-6933.